USS Constitution (Old Ironsides) America's oldest still in commissioned warship. "Hey, Dad can we go on her?... Please." "Okay son let's take a ship's tour." "Hey, Dad can we go on her?... Please. Okay son let's take a ship's tour." 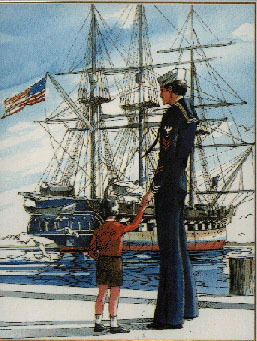 "Let the journey begin......"
On 23 August 1779, the USS Constitution (Old Ironsides) set sail from Boston loaded with 475 officers and men, 48,600 gallons of water, 74,000 cannon shot, 11,500 pounds of black powder and 79,400 gallons of rum. Her mission: to destroy and harass the English shipping. On 6 October, she made Jamaica, took on 826 pounds of flour and 68,300 gallons of rum. 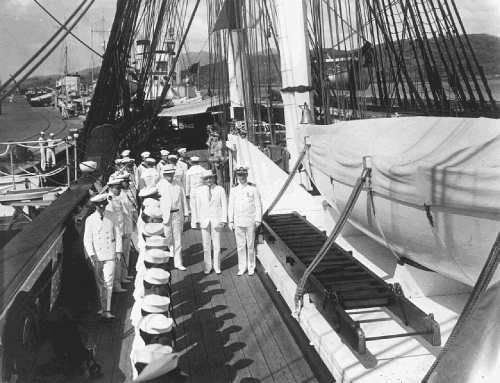 Three weeks later the USS Constitution made a port call in the Azores. Here she took on the following provisions; 550 pounds of beef and 6,300 gallons of Portuguese wine. On 18 November, the ship set sail for England where her crew captured and scuttled 12 English merchant vessels and liberated their rum. After this engagement the USS Constitution found itself without cannon shot. Nevertheless, she made her way unarmed up the Firth of Clyde for a night raid. Here her landing party captured a whiskey distillery, transferred 40,000 gallons aboard and sailed for home. 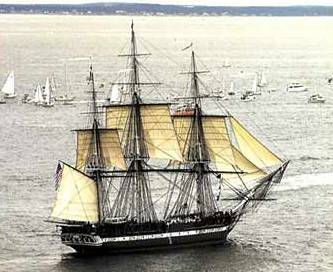 On 20 February 1780, the USS Constitution arrived in Boston with no cannon shot, no food, no powder, no rum, and no whiskey. But the ship still had 48,600 gallons of water. Probable EPA Award of a Gold Certificate for water conservation. Courtesy of : U.S. Atlantic Command Joint Training Analysis and Simulation Center. Old Ironsides...let the voyage begin. The USS Constitution on her National Tour 1931 thru 1934 spent her first Christmas in Panama Canal Zone. The little kids were let out of school and they lined the banks of the Panama Canal to see this gallant warrior past through. Here you see it locking through at Miraflores Locks. 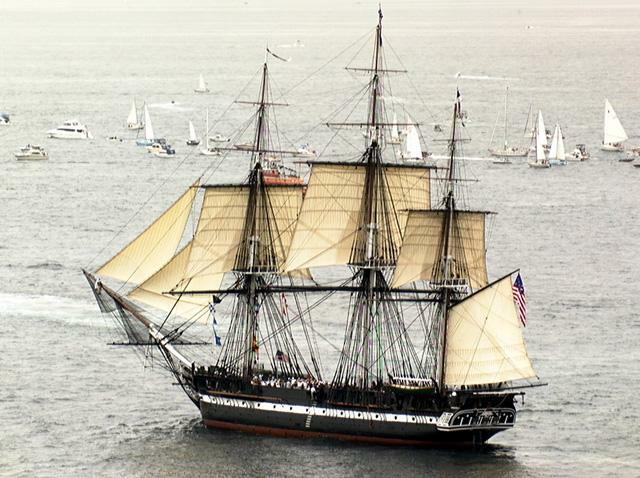 Old Ironsides is the only ship in the US Navy that was never defeated in over 42 engagements.